Saw The Hunger Games: Catching Fire over the Christmas Break and loved. it. Hoping it's better late then never for some reflection. Because this line from Effie? Man, did it kill me. The tears welled up in her eyes and the heart-wrenching words escaped her lips. Effie the soiled veteran of the Capitol. She breaks. I spend my life working with some of society's most oppressed and impoverished. Then, dressed in my expensive and extravagant clothes, I go back to my big, warm, safe house, eat a disgustingly big meal and fall asleep in my big, warm, safe bed. 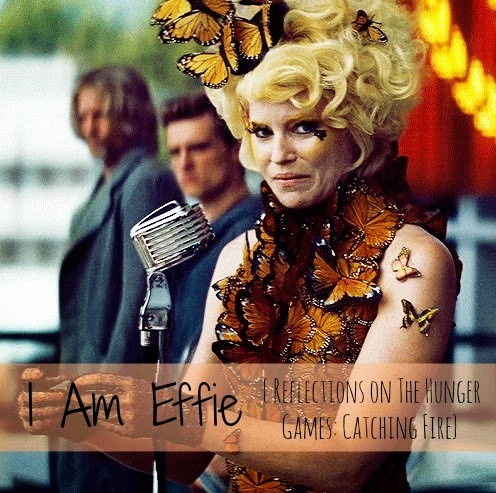 And Effie, she's about to send her beloved victors back into the arena - back to the injustice she saved them from. Back to the injustice millions face each day. And she realizes something awful, terrible, horrible. This is all her fault. Her addiction to the Capitol - the luxury, the extravagance, the everyday comfort - has fuelled a train of injustice until that train has barrelled right into her heart and broken her. The wealth that she probably didn't even choose to be saturated in, the wealth that she has learned to love so dearly, and the system called the Hunger Games that she believes in, heart and soul - this has fed the suffering and injustice of millions for years. and years. and years. It's here, in the midst of these awful, unfair, Quarter Quell 75th Games, that she realizes the horrible truth. This is all. her. fault. And, with tears welling in her eyes - she is so sorry. She is devastated, crushed, mortified. Because while she wants to help her victors - while she is so sorry - she can't fathom giving up the Capitol. Yet each day, I fuel the Capitol. While I want to fight injustice, to love the least of these, sometimes I want the Capitol more. I can't fathom giving it up. And, with tears welling in my eyes - I am so sorry. That train, barreling right into my heart and breaking me. I am Effie. The soiled veteran of the Capitol. And the only hope is that it is for the better.